When Priscilla Presley needed an ensemble to wear for her Sept. 23 appearance at James Burton’s International Guitar Festival, she stopped by Knox Goodman’s unannounced earlier in the day. While she was browsing, Presley noticed Jolene Woods’ Ambiance beauty salon in the building and asked her on the-spur-of-the moment if she would style her hair. “It was a basic shampoo and blow dry. Very simple,” said Woods. On her first trip to Shreveport, Presley was squired around by Shreveport film guru Arlena Acree. Presley, who does not eat meat, ordered the “fresh catch,” which was cod and the dessert sampler at Mabry House the night before. “She loved the Balsamic ice cream. And she loved eating in an old house,” said Ginger Mylar, who is co-owner with hubby, Chef Steve. Presley’s party dashed into Wine Country for a salad after the shopping spree at Knox’s. At Knox’s, Presley bought a very fitted black-on-black abstract zebra print street length dress with long sleeves by Ronny Kobo to wear on stage. To accessorize it, she picked up a Jenny Bird chain necklace and Azaara earrings. And added another outfit to the stack. Showing off a snake-inspired ring with black pave diamonds, Presley said it was the gift of her son, Navarone, who collects snakes. “She said he gave it to her, so she would think of him when she traveled,” said Knox manager James Osborne. “It was exciting for us. She was very sweet and said she needed clothes and this was a lovely shop,” said Goodman. Priscilla Presley, the former wife of Elvis Presley made a special guest appearance July 29th on NBC's Today Show with Kathie Lee & Hoda. Priscilla Presley, Elvis Presley's former wife made a special guest appearance July 29th on NBC's The Today Show, with Matt Lauer. Priscilla and Matt Lauer, discussed the Graceland Auction from the collection of Greg Page, and the new interactive experience beginning at Graceland August 9th. Guests will tour Elvis Presley's Graceland Mansion with iPad's and enjoy a Graceland Archives presentation experience via the Graceland Platinum tour and Graceland VIP tour. In addition to speaking with Matt Lauer, Priscilla also spoke with Kathie Lee & Hoda on their portion of the Today Show. Priscilla Presley, will make a special guest appearance on NBC's, Kathie Lee & Hoda. Check your local NBC listing for the exact time. Priscilla Presley, was on The Today Show with Matt Lauer. There was a small segment with Kathie Lee & Hoda, but Priscilla's main appearance was on the regular Today Show. CLICK HERE to watch the video segment featuring Priscilla Presley & Matt Lauer! The video seen above features Priscilla Presley speaking to thousands of Elvis fans at the opening ceremony of the Collingwood Elvis Festival. Photo is from Priscilla's Facebook page. On stage at the opening ceremony for the Collingwood Elvis Festival: Priscilla Presley and "Shades of Elvis" Photographer, Christoper Ameruoso. 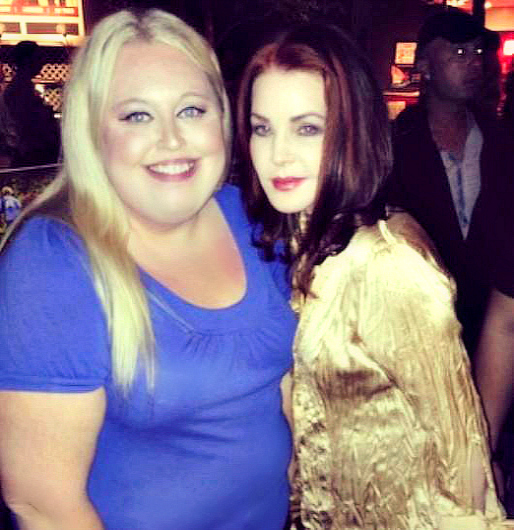 Priscilla Presley, the former wife of Elvis was a special guest at the Collingwood Elvis Festival. This year celebrated the 20th Anniversary of the Collinwood Elvis Festival. Priscilla Presley's, was proud and glad to attend for the first time at Collingwood, and this was in fact her very first time making appearances at any type of Elvis Presley Festival. Along with Priscilla, was celebrity photographer, Christopher Ameruoso. Priscilla and Ameruoso, have published a new and very unique hardback Elvis photography book. The book is titled,"Shades of Elvis", which features numerous celebrities posing while wearing a pair of Elvis' well know famous sunglasses. - Gala dinner (Thursday, July 24) a $250-a-head evening at the Cranberry’s Bear Estate. "I’m here because I, too, want the generations to be able to learn, know and experience Elvis Presley through my eyes. I think great-grandparents are here, grandparents are here, parents are here, they’re bringing their children — what better festival for them to come to… this is a family event, and I’m here to appreciate it." "I think here, he would tell you how much he appreciated all of you. I don’t think he was ever at a loss for words, but he would be at a loss for words. I have to say, he would be completely amazed — I wish I had a better word — it would be to him to see what you’ve created here in this town. I sometimes think, wow, all the fans who supported him back in the day, still here in the future… he’s been gone three decades." "Through his music, through his humble beginnings, he has touched a bit of everyone. His songs were carefully chosen — the ones that he chose, not the movie songs — sends somewhat of a message of emotions to all of us, whether he was a mother’s son, whether he was a military man,” she said. “He was authentic, and there’s something that connects to him because he’s not in any way trying to be anything but himself. No pretense whatsoever, he didn’t think like that, he didn’t rely on tricks, on things to create an event other than what his passion was." What did Priscilla Presley Like About Living in Memphis? Priscilla Presley, regularly answers questions from Elvis fans via her Facebook page. Priscilla, answered a question July 23rd, regarding the time she lived in Memphis. Q: Did you enjoy living in Memphis? What did you like most and least about living in that city? A. "Yes I liked Memphis very much. I liked all the things we did there. Like going to the amusement park called Libertyland. We went to the Memphian Theater nearly every night to see the latest movies, I enjoyed having our friends over, motorcycle riding, horseback riding, etcetera. The least was probably at times, the weather." She will forever be known as the wife of Elvis. PHOTO: Priscilla & Lisa; Listening to Miranda Lambert's NEW song, "Priscilla"
Priscilla Presley and Daughter, Lisa Marie Presley, are pictured above listening to Country Music Entertainer, Miranda Lambert's, new song, Priscilla. Priscilla shared the photo on her Facebook page. Country Music Artist, Miranda Lambert, has a NEW song titled, "Priscilla" and the song is inspired by, Priscilla Presley. The rockabilly-flavored romp was written expressly for Lambert by her frequent collaborator Natalie Hemby, after being inspired by a television documentary about Elvis and Priscilla Presley. The song is funny, but with a bittersweet undertone: being "queen of the king" did not serve Priscilla very well. Lambert, in a very different position as Shelton's co-royal on the contemporary music scene, sings with the self-awareness of someone who can't completely shake emotional insecurities despite all of her success. In an email exchange with NPR.org, Lambert answered a few questions about "Priscilla," Platinum and her creative process to accompany this song debut. Priscilla Presley, was such a style icon, but obviously her relationship with Elvis was ... complicated. You and Blake are no Elvis and Priscilla. I love that you invoke her as an icon. It's fun and kitschy but also gives her some respect. Your performance is fun, done with humor, but also has a bit of an emotional edge in there. What were your thoughts as you were approaching the material? Miranda: "Exactly that. To keep it fun. Not to be taken too seriously, though it is a serious subject at times. The subject being ... the pressure put on a couple in the public eye. The tabloids and untrue stories are laughable at this point. But the hardships of time apart and figuring out how to have alone time in a business like ours is something you have to figure out. I think this song addresses the issues perfectly. Priscilla is an icon. Who are these men without us women! (wink wink)"
Priscilla Presley "Congress must act to end cruelty to show horses"
Every day, behind closed stable doors, Tennessee walking horses suffer immense pain at the hands of their trainers. The horses’ legs are soaked with caustic chemicals and wrapped in plastic to “cook” their flesh. Hard objects are wedged into the tender parts of their hooves making each step painful. Trainers use these cruel practices to force horses to perform the exaggerated “Big Lick” gait prized at some horse shows. To further accentuate this extreme, unnatural gait, tall, heavy “stacks” are nailed to the horses’ hooves, and chains are hung around their legs that exacerbate the pain. This abuse is unconscionable, and Congress passed the federal Horse Protection Act (HPA) in 1970 to stop it. But Big Lick trainers make every effort to evade detection of their crimes, and the industry has been permitted to police itself with devastating results. The fight to stop this practice, called soring, is personal for me: Elvis was a big admirer of Tennessee walking horses and together we owned several. Visitors to Graceland can still see these beautiful creatures grazing outside the barn. I’m proud to continue that legacy at Graceland, and to be a permanent part of Tennessee’s culture. The Big Lick subculture of cruelty and corruption is giving the state a bad name. I want to see soring become a part of Tennessee’s past, and the only way is for Congress to pass the Prevent All Soring Tactics (PAST) Act, H.R. 1518 / S. 1406. The PAST Act’s needed reforms to the Horse Protection Act will finally close the door on soring by banning the devices involved in the soring process, increasing penalties for violations and ending the industry’s failed system of self-policing, a recommendation of the U.S. Department of Agriculture’s Office of Inspector General in a 2010 audit of the HPA enforcement program. The PAST Act is endorsed by the American Horse Council, the American Association of Equine Practitioners, the American Veterinary Medical Association, every state veterinary medical association, the National Sheriffs’ Association, the Association of Prosecuting Attorneys, more than 50 leading horse organizations and many others. It has been co-sponsored by 328 U.S. representatives and senators of both parties, and approved by the Senate Commerce Committee. There is ample evidence that soring is rampant in the Big Lick sector of the walking horse industry, and its techniques for soring horses and duping inspectors have become more sophisticated over the years. In a further attempt to continue its abusive practices, this sector has found a handful of allies in Congress to push legislation that would codify, even worsen, the corrupt self-policing scheme that has allowed soring to continue. It’s clear that its main design is to stand in the way of meaningful reform and cause confusion. Congress and the public will not abide any more false promises of reform from Tennessee walking horse abusers. Support for the PAST Act is overwhelming, but congressional leaders need to bring it to a vote. This bill is the way forward, out of a long history of corruption and cruelty in this abusive faction of the walking horse industry and into a thriving, humane future for these horses and those who love them. Please join me in calling on our members of Congress to co-sponsor the PAST Act, and to do everything they can to ensure its passage. Priscilla Presley, the ex-wife of Elvis Presley, is an actress and a businesswoman. She is co-founder of Elvis Presley Enterprises, the company that operates Graceland. She is partnering with the Humane Society of the United States to raise public awareness of soaring. Priscilla Presley, Wednesday, June 4th at the opening of "Joseph And The Amazing Technicolor Dreamcoat" at the Pantages Theatre, Hollywood, California. Priscilla Presley has never stopped loving Elvis. And he never stopped loving her. Yes, they were married for six years. Yes, they were divorced. But their devotion, love, and respect for each other remained long after the ink was dry on the divorce papers they signed in 1973... actually, for the rest of the King of Rock 'n' Roll's life. Priscilla has dedicated so much of her time and energy since Elvis' untimely passing in 1977 to the fans who love and adore him. "Shades of Elvis" -- which was the clever idea that photographer Christopher Ameruoso brought to the "Dallas" actress after they spent a day together on a photo shoot for a magazine cover several years ago -- became her passion. It was another chance to share one more window into his soul. "The idea," Priscilla explains in the foreword of the book, "was to photograph (in classic black-and-white portraiture) artists, icons, and legends while they were wearing Elvis' sunglasses. Even more than that, we wanted to provide the book's famous subjects with a brief glimpse of the world the way Elvis saw it, through those shades, and then have them share what came to mind." Want to see what Cher looks like wearing Elvis' shades, or Sir Elton John, or Johnny Depp, or Snoop Dogg? How about 77 other high-profile names? Check it out here. The Huffington Post caught up with Priscilla to discuss all things Elvis: her labor of love - "Shades of Elvis," why it was important for her to take on this two-and-a-half year project for past and future fans, why their love for each other never died, what song he dedicated to the fans he loved unconditionally, and much more! "Shades of Elvis" is such a sweet, affectionate tribute to Elvis on your part. Tell me why you ultimately decided to do the book and were you thinking of Elvis throughout the whole process? Priscilla Presley: "Yes, of course I was. When Christopher first approached me about his idea I thought, 'What a great idea, to have people with such popularity that would give their quote on how Elvis Presley inspired them, how he changed their lives or touched their lives in some way.' And when the generation of today would see in the book people they admired i.e. Johnny Depp, Snoop Dogg, Tim Burton, Cher etc. and hear why Elvis was so important, what he contributed to music and not only our culture but many cultures, it was a no-brainer. For me, it's all about keeping his legacy now and in the future. Keeping him current. There's a bit of an edge to the book. It's in black and white, simple and understated but impactful with content. Elvis always had an edge and I feel this book represents him well. It doesn't have any pictures of Elvis. Everyone knows who he is. It's about what is said about him and by whom." Tell me about the sunglasses. Did you have those made for Elvis? "No, he bought them in 1970. We were shopping on Sunset Boulevard and we walked into a store that sold sunglasses. He was trying on different shapes and Dennis, the owner, showed him the pair that would look right for his face. He told Elvis the shape was good because it covered his eyebrows and that when picking out sunglasses, that should be considered. Elvis always wore that same shape, he never varied. Unless, of course, maybe in a film." So you saved those original sunglasses all these years? "Yes we did. Those are his original sunglasses that we have in the archives at Graceland." How did these celebrities feel holding Elvis' sunglasses? "Everyone who held his sunglasses had so much respect and care. They handled them so gently as if a fragile piece of art. Christopher said Johnny Depp just studied them for about three minutes, carefully tilting them in different positions and with utmost respect. Each person could relate to the glasses however they wanted. Christopher just shot the photos as they related to the glasses. He has such an eye for aesthetics and form." How did you go about the selection process when you were picking all of these celebrities? "It was those that in some way shaped, inspired, or created an effect on our society. Everyone here is well-known, well-regarded, or someone who has even had some controversy. Of course, Elvis had controversy in his life too. In going through the book Elvis inspired or affected those one would never suspect. I had no idea many were such fans of his until going through the quotes. Some made me laugh, some made me think, some made me cry. We have, I think, 81 beautiful images." I'm going to throw out a few names who were in the book and I'm curious as to how they were selected by you and Christopher together. Tom Jones was a big fan of Elvis, I know. I'm sure Elvis was a fan of his. Did you call him yourself? "Tom is a really good friend. We were at a dinner party together. He asked me what I was up to lately and I told him about "Shades of Elvis." He loved the idea and when I approached him on participating in it he just said, "Absolutely." (She tries to impersonate his voice) in that wonderful voice. (Laughs)"
I loved Jose Feliciano's quote, talking about visiting Graceland, standing on the lawn inside the gates during the 35th candlelight vigil for Elvis where he felt a hand touch his right shoulder, and when he turned around, nobody was behind him. "Was it Elvis telling me he was glad I was there?... I thought about that moment a thousand times ever since." It gave me chills. "He gets very emotional about it. He's such a wonderful human being and so talented. " Let's talk John Stamos. He's not bad to look at. His pose was John Stamos channeling Elvis, I thought. "No, not bad to look at at all (laughs). John is also a good friend and he was on board the minute I asked. He's an enormous fan of Elvis. I don't know if you read his quote or not, but I thought it was brilliant. ("Wearing Elvis' TCB shades is like trying on Dorothy's ruby red slippers. Although the slippers would hurt my feet and I wouldn't look as cool...")"
Tell me about Cher. How did you get this incredible icon to do a photo shoot for this book? "Cher and I have a mutual friend. I approached him and told him how much I would love Cher to be a part of the book and I asked, "Do you think she'd consider?" Well... she agreed. With her busy schedule, it was a bit difficult because she is on-the-go, so trying to get her pinned down was a trek. Eventually, It was arranged that Christopher could have the photo session between wardrobe fittings. It was in, out, and done. Painless. He said she was very accommodating, beautiful, and loved the project." "One thing, among many, about Christopher that I love -- because I'm an artist myself -- is that he is quick. The majority of people that are in the limelight, hate having to pose for photos. You do, of course, get exceptions. But it could be many hours long photo sessions. And with lots of people involved on the location "With "Shades of Elvis," the people chose their own environment and location. A place where they would feel relaxed and comfortable. He made it so easy -- just him and his assistant, who happens to be his beautiful wife, Daniella. The sessions could be done in 15 minutes." Did you think about Paul McCartney or Ringo? Those two would have been really cool. "Yes, absolutely. Paul lives on the east coast and in England. He was difficult to pin down as he rarely comes to L.A.. We almost had him when he breezed through L.A. last year. I'm hoping to get both Paul and Ringo for our next book. In fact, President Clinton agreed to be in the book. It was being arranged for his next trip to L.A.. It was at the time that President Mandela had passed and, of course, the plans changed." Changing the subject, when you and Elvis were married, I remember thinking you were the luckiest girl in the world. Then when you two got divorced, I was devastated. You two seemed so perfect for each other. I'm glad you and Elvis were friends and continued to love and respect each other so much after the divorce. It's such a testament to your character... and his. "Thank you, Pat. Honestly, it never really felt like we were divorced. We always cared for one another. One wonderful thing about our relationship and our love for each other is that it never died. We were the best of friends after. We were still calling each other all the time. It goes to show you that when one separates, it doesn't mean that you don't love still. I didn't leave him because I didn't love him. Our daughter Lisa Marie gave us the biggest compliment in an interview recently when she was asked how did she feel when we divorced. She said "I never knew they were divorced."" Elvis seemed to love his fans so much. Did you two ever discuss his fans and how much they meant to him? "Absolutely. He attributed his fans for taking him to the heights he never thought he could attain. He recognized their loyalty, was thankful for their support, and appreciated their devotion. The last song he sang on stage: "I Can't Help Falling In Love With You" was a dedication, a thank you to each and every one of his fans." Did Elvis have some favorite artists or entertainers that he loved? And was he ever intimidated by any artists? "Elvis loved to entertain and loved being entertained. He felt there was room for everyone. Anytime we were in Vegas we would go to the main showrooms and all the lounge acts that we could catch. Tom Jones, Barbra Streisand, Righteous Brothers, Nancy Sinatra, Dean Martin, Ann Margaret, Fats Domino, Sammy Davis Jr., and so many more. Whoever was in Vegas, he was the first one to sit, watch, and cheer them on. And when one of the guys would tell him who was appearing, they would ask if he wanted them to send flowers to the women. He'd say yes go ahead. He was such a gentleman and a true professional." You weren't in the book. I actually wanted to see a picture of you wearing Elvis' sunglasses. "No, I'm not in the book. This book is a tribute to Elvis by those who say it so well with their quotes and by their magnificent images along side it. It's a testament to who he was by those who recognized what he accomplished in his relatively short life. Not only did he change the course of popular music scene, he changed our culture, our dress. He was a national phenomena, an American original. I often think what he would have thought as he passed each page viewing each image and what each quote would mean to him. I honestly think he would be overwhelmingly touched. As words penetrated deeply in his soul. It's a validation from his peers. It wasn't always like that. He was different and he knew it. It took a while to be accepted. But time has a way to sort things out. I wish he was here today to see all the magnificent talent that took part in the making of this table book dedicated to him." "Shades of Elvis" has reached the #1 best seller list on the Blurb.com website. Blurb.com is the largest independent book publishers on the internet with almost a million book titles to their catalog. Elvis Presley Fans of Nashville, would like to wish Priscilla Presley a very Happy Birthday!! On Friday, May 16, Priscilla Presley, the former wife of Elvis Presley and mother to Lisa Marie Presley, revealed in an interview on SiriusXM that she is currently working on a Broadway show about her life. Priscilla was speaking with Elvis Presley's friend, DJ George Klein, on Elvis Radio. Priscilla didn't reveal many details but she did say that she was working on a musical about her life focusing on her teenage years and how she met Elvis. Presley explained that she is working with a talented female writer in bringing the story to life. No word on when this production will launch. The television and movie actress is no stranger to live theater. During the interview she also announced that this November she will be returning to her role as the wicked Queen Morgiana, the evil stepmother to Snow White, in the London production of "Snow White and the Seven Dwarfs." She first took on the role in the production in 2012 at London’s New Wimbledon Theatre. During the interview, Priscilla also discussed her new photography book, "Shades of Elvis," that she worked on with photographer Christopher Ameruoso. Presley said that due to the positive response they've gotten from fans and celebrities, they are planning on a second edition of the book. "Shades of Elvis" features over 75 celebrities striking an Elvis-inspired pose while wearing an authentic pair of The King's sunglasses. The long list of celebrities appearing in the book includes Johnny Depp, Adam Lambert, Cher, Celine Dion, Charlie Sheen, Ozzy Osbourne, John Stamos, Michael Buble, Helen Mirren, Tom Jones, Willie Nelson, Rob Lowe, Robert Plant and many more. Priscilla said that many celebrities that have seen the book are requesting to have their picture taken with Elvis' sunglasses, leading the way for future editions of the book. For years fans have mailed autograph request letters with photos for Priscilla Presley to personally autograph. Unfortunately, Priscilla has now stopped that process. At age 68 years old it is understandable as to why this can be very time consuming. Thank you for autographing photos, Priscilla! Follow Priscilla on Facebook and Twitter! Priscilla Presley, shared the above photo on Instagram. Priscilla and son, Navarone Garibaldi pose with his snake Ling Ling. Click here to follow Priscilla on Instagram! Priscilla Presley, April 26th, 2014 at the ‘Chiller Theatre Toy Model and Film Expo’ in Parsippany, New Jersey. Priscilla and Photographer, Christopher Ameruoso, promoted and autographed their new book, Shades of Elvis. 'Shades of Elvis' is a new photography book by Priscilla Presley, and celebrity Photographer, Christopher Ameruoso, that host over 75 celebrities wearing or posing with a pair of Elvis Presley's famous sunglasses. Organizers of the annual Collingwood Elvis Festival are proud to announce that in celebration of our milestone 20th Anniversary year, Priscilla Presley will join the festivities for the 2014 Collingwood Elvis Festival. Learn more about purchasing tickets by visiting: CollingwoodElvisFestival.com. Priscilla Presley, was a special guest on CBS' "The Talk", Friday, March 14, 2014. The complete episode is on CBS.com. Click here to watch Priscilla Presley on CBS' "The Talk"! Priscilla Presley is on a mission. Cruelty to animals is never acceptable. Never! Presley made an important stop in Washington, D.C. recently to lobby Congress to pass the "Prevent All Soring Tactics" (PAST Act) that will strengthen enforcement of the 1970 Horse Protection Act. "Congress enacted the Horse Protection Act in 1970 to make illegal the abusive practice of 'soring,' in which unscrupulous trainers deliberately inflict pain on Tennessee Walking Horses' hooves and legs to exaggerate their high-stepping gait and gain unfair competitive advantage at horse shows to create a pain-based exaggerated gait known as the "big lick." Soring methods include applying caustic chemicals, using plastic wrap and tight bandages to 'cook' those chemicals deep into the horse's flesh for days, attaching heaving chains to strike against the sore legs, inserting bolts, screws or other hard objects into sensitive areas of the hooves, cutting the hooves down to expose the live tissue, and using salicylic acid or other painful substances to slough off scarred tissue in an attempt to disguise the sored areas. Sored horses often live in constant and extreme pain throughout their entire show ring careers." The "Dallas" actress says the PAST Act amendment is simple and does not cost the federal government any additional money. It is designed to save the Tennessee Walking Horses from cruel and inhumane abuse. She spoke with The Huffington Post about why she became involved in this cause, and also shared some personal information about her life with Elvis -- and their Tennessee Walking Horses. It is heartbreaking. When it aired on ABC's Nightline in 2012, it shocked the nation. Opponents of the bill insist that cruelty in this faction of the industry is perpetrated by only a "few bad apples" but the more "I talked with people that were in the Tennessee Walking Horse industry, they spoke out on how tortuous and abusive it is and that soring still goes on. I felt the need to inform the public." That video resulted in the recent successful felony prosecution of well known Hall of Fame and Tennessee Walking Horse National Celebration world grand champion rider and trainer Jackie McConnell for conspiracy to violate the HPA (Horse Protection Act) and the state of Tennessee's prosecution of him for cruelty to horses in his care. That undercover investigation revealed what was going on in his Tennessee training facility. He was caught but it IS going on in many, many other facilities as well. There have been more than 9000 documented violations of the HPA since 1986, and more than half are repeat violations. You came to Washington to help pass legislation to protect the Tennessee Walking Horse from abuse, correct? "Yes. I came to Washington to lobby Senators and Congressmen to co-sponsor in support of the PAST Act and I'm hoping by making this public people will join me to help me get this bill passed." Links are available for them to contact their Congressman saying they support the PAST Act. That's all they have to do. You would think this is a no-brainer, that this would pass but there IS opposition. The law was passed in 1970 to stop soring but Horse Industry (HIOs) found loopholes and continued soring. USDA is charged with enforcement of the Horse Protection Act, but as the result of a 1976 amendment to the act, the USDA has for decades certified the horse industry organization to conduct the majority of inspections at horse shows. This self regulation scheme has failed miserably and has to be abolished. USDA inspectors are threatened by exhibitors at horse shows and must be frequently accompanied by security. If they had nothing to hide (like covering the scarred legs with paint or taking off other paraphernalia when USDA inspectors are around) why aren't they welcomed? That's why being their own inspectors is not working." Which is a conflict of interest, isn't it? "Yes, It's a conflict of interest. I'll be honest, it's a boys club. Mostly all are either horse owners, trainers or exhibitors. They're not going to expose each other. They protect each other." There was a very telling article in "The Tennessean" in January about Bill Harlin who was a former President of The Tennessee Walking Horse Breeders' & Exhibitors' Association and is the owner of Harlinsdale Farm. He has been in the Tennessee Walking business for eight decades and admits this is still going on. He says soring is an inhumane practice. It must end. The Tennessee Walking Horse Industry involves high-dollar activity at the expense and welfare of their horses -- who, by the way, they profess their love for. It comes down to profit. Have you always loved horses? "Yes I have. I have an affinity for animals. I'm not for anything alive being tortured, abused or violated upon. Especially, those who have no voice and are defenseless." Did you and Elvis ride horses? "Yes. It started with Elvis surprising me with a three year old black quarter horse named Domino for my Christmas present. I would ride every day and he would watch me from the upstairs window. He saw how much I enjoyed riding and decided he would start riding too. He purchased for himself a golden palomino, Rising Sun. It wasn't long after that we visited a beautiful farm in Collierville, Tenn. The owner was Geoge L Lenox and he showed Elvis his pride and joy -- Grand Champion Carbon Copy. Elvis thought it was the most beautiful horse he'd ever seen. Then George asked if he'd like to see how he rode. Well that was it... Elvis wanted a Tennessee Walking horse. So he purchased Bear. That was the beginning of the beautiful Tennessee Walking Horse history at Graceland." I've been following your tweets lately. You've been tweeting about your book, "Shades of Elvis." Tell me about that. ""Shades of Elvis" is a table book photographed by Christopher Ameruoso. We had become friends after he photographed me for a popular magazine. One day he approached me about an idea he had for a long time, a table book of photos of people of fame wearing Elvis' original sunglasses photographed in black and white on a two page spread and a quote on Elvis. I didn't even have to think about it. It was different, edgy, very unique. We had so much support from everyone in the book. It's a wonderful tribute to Elvis by those who admired and appreciated what he did for music in not only our culture but many cultures. I know Elvis would be extremely touched by looking through the pages of those acknowledging him. I'm very proud of it." You wrote a book years ago called "Elvis and Me." Was that an emotional book for you to write? "Absolutely. It was an emotional experience. We've always been very private and I felt, in a way, that I was betraying him by revealing our life. It took me a year and a half to come to the conclusion that it was the right thing to do. The reason why I decided to write that book? Albert Goldman, an accredited writer, wrote biographies on comedian Lenny Bruce, John Lennon and then he wrote a book on Elvis. I read some excerpts and was infuriated with what he had written about him. I did not want that book to be the definitive book on Elvis Presley. Now remember, this was around 1981, there weren't any books that were written about him then. I think there are over seven hundred or more books that are written. And most not creditable." When was the first time Elvis took your breath away? "The first he took my breath away? That's a great question because there's a couple of times he took my breath away. I think seeing him on the screen in "Love Me Tender." I was so young; 11 years old. I was living in Austin, Texas at the time, my father was stationed at Bergstom AFB. It was a Saturday, that was movie day. My girlfriend, who loved Elvis was so excited to go and see his first movie. I did see him when he was on the "The Ed Sullivan Show," of which my parents, like other parents, didn't want their children to watch Elvis. When he was on that big screen, I thought 'Oh my God!' He's so handsome! He just took over the screen. The impact of him in that film; I've had never experienced that before watching a movie." Then you met him a couple years later? "Yes, I did. I met him in '59, three years later." When you saw him in person and your eyes met, he must have taken your breath away again. "I just thought, wow, he's just as good looking as he is on the movie screen. It was obviously no disappointment whatsoever. I just remember thinking he's so handsome." "I was in Wiesbaden, Germany. My father was in the Air Force. We had pretty much just arrived there. We were introduced to a place called the Eagles Club where military families would go to eat, hang out and on the weekends go for entertainment. It was very close to where we lived and I would go often to listen to the jukebox and write sad letters to my friends telling them how much I missed them already. One day I was approached by this young man who said he saw me there a few times and asked if I liked Elvis. I answered, yes, who doesn't? He then asked if I'd like to meet him. I asked, "What do you mean?" It turned out he was a friend of one of the guys that hung out with Elvis. He said he and sometimes his wife would go there on weekends, that Elvis had little parties or gatherings there. I told him that I didn't know, that I had to ask my parents. My parents met the couple and it was suppose to be a one night meeting with Elvis. The rest is history. That's the simple version." When you walked in and saw him, did you think you'd see him again? "Not at all. Never in my wildest dreams. I was just a 14-year-old girl who had the opportunity to meet Elvis Presley." I had the great pleasure of interviewing your daughter, Lisa, last year. She was so sweet and adorable. I was just so impressed with how kind and gracious she is. You obviously did a great job raising her. "Oh, thank you. I appreciate that." You and Lisa have always been close, I'm guessing. "Not always. We've definitely had our ups and downs. (Laughs) It was not easy. I'm sure like any family, or mother/daughter relationship. I was pretty strict with her and that was probably one of our biggest battles when she was growing up. My biggest fear was her getting mixed up with the wrong crowd and with the drug scene. Plus dating with both of us." Now that Lisa's grown, are you close? "Very much so. She's my best friend. We talk about everything." Do you love being a grandmother? "I do so much. Those little babies are just absolutely a joy. I would rather be with them than go to any movie or on any outing whatsoever. They are the most entertaining little beings. Never a dull moment." They're so adorable! I saw them in a People Magazine Photo video. "And they're so polite and so smart. I had a big Thanksgiving dinner at my home with about 27 family members. After dinner I started taking photos of the twins, Harper and Finley, who had turned five that October. A couple of my pictures were blurry and I said, "Hmm, I don't know what's wrong with my camera some of these photos are blurry"and Finley raises her hand and says, "Nona, (they call me Nona) Nona, Nona, I think, excuse me, excuse me, Nona. I think you have your finger over the camera." She put me to shame. (Laughs)"
I got to meet with Lisa at Wolf Trap in Virginia. I saw her perform. She was so, so, so good. Were you nervous when she first got involved with her music? "Absolutely. I know the industry pretty well and it's a tough industry. And I feel I know the public pretty well. I just didn't want her to get hurt or not be taken seriously. Music is certainly her calling just as it was her father's. You know, for the longest time I didn't even know she could sing! When she was still a teenager she would close her bedroom door put the music on loud and sing to whoever was singing. She just kept it from me. I was just awed when I first heard her voice when she recorded her first album. I was so proud of her and I am still proud of her now. She works hard and is so deserving of any accolades she receives." You tweeted happy birthday to your son Navarone on March 1st. How old was he? "My son was 27. He has his own band called Them Guns. Remember the movie, "The Guns of Navarone?"" Oh, yes! Is that where he got his name? "Yes, that was one of my favorite movies. Navarone. It's a strong name and he's very strong but yet very sensitive." I loved watching you on "Dancing with the Stars" Were you nervous about doing that show and did you feel like you were out of your comfort zone? "Yes I was out of my comfort zone. To this day I wonder, what was I thinking. (Laughs) I was on the sixth season and no one really spoke out on how difficult it was in many ways. Now the contestants are much more verbal. Just conquering the fear factor alone was terrifying. At the time I think it was around 25 million people watching -- live. Talk about pressure! When you're nervously standing back stage waiting your turn and the announcer introduces you and your dance partner, the green light goes on and you walk out on stage hopefully ready to perform. I still get chills thinking about that moment." To understand more about soring practices, check out this video. Priscilla Presley will reprise her role as the wicked queen in Snow White and the Seven Dwarfs. December 5, 2014 - January 4, 2015 at the Manchester Opera House. Priscilla says she fell in love with panto after starring in the same role at the New Wimbledon Theatre in London two years ago. She says: “I was introduced to the world of pantomime two years ago and I can honestly say it was one of the most fulfilling experiences of my life. My grandchildren absolutely loved seeing me on stage and I can’t wait to get that costume back on again and start terrorizing the people of Manchester!" To book tickets, contact the box office on 0844 871 3018 or visit www.atgtickets.com/manchester. Priscilla Presley will be a special guest on CBS's "The Talk" Friday, March 14th, 2014. 2:00 p.m. ET/ 1:00 p.m. CT and 1:00 p.m. PT. Editor's note: Best known as the ex-wife of Elvis Presley, Priscilla Presley is also an actress and businesswoman. She was thrust into the role of managing the late singer's Tennessee mansion, Graceland, after Elvis' father died, and opened the home to the public in 1982 to save it from financial ruin. Presley enjoys being involved with charitable work. For the past 11 years, she has been an ambassador of Dream Foundation, a Santa Barbara-based wish-granting national organization for adults battling terminal illnesses. Santa Barbara, California (CNN) -- I first heard of Dream Foundation in 1997 when the charity requested a visit to Gracelandfor a dream recipient. After the visit, I received a thank-you note and photo of the dreamer in front of the Graceland gates. I was moved by her experience and decided I wanted to get more involved, so I picked up the phone to find out more about the foundation. I was absolutely mesmerized and instantly attached to their unique mission of granting wishes to adults with terminal illnesses. When I was asked to be an ambassador and spokeswoman for the charity, I couldn't say yes fast enough. How could I turn down such a great cause? I've been honored to travel and represent the organization across the country at special events and corporate meetings, as well as in public service announcements, television and print interviews. But the best part of my "job" is seeing the hands-on attention and care we give to the people we serve. There's a common misperception that all the dreams we fulfill are for grand vacations. But many requests are profoundly basic: Pay a utility bill, or provide mobility with a scooter. No matter the scale of the dream -- whether it's a peaceful escape to the beach, a long-delayed family reunion or an appliance that works -- every one is touching and heartwarming because it unites people. Dreams provide comfort and closure, not only to the recipients, but to their family members as well. Ill parents often want nothing more than to see their kids smiling and having fun again. In turn, these dreams also give children an opportunity to see their parents happy, carefree and outside of the hospital's sterile environment. One dreamer really stands out in my mind: Helena, a young girl of 23 with cancer. She had a beautiful voice and wanted to be a singer. The Dream Foundation contacted Grammy award-winning songwriter Diane Warren and got permission for Helena to record a song in Diane's studio. When Helena played the recording back, it was heartwarming to see her smile and be so full of joy. The song not only made Helena happy, but her family happy as well, knowing her dream had been fulfilled. How can you beat that? After Helena passed, her husband was left with that precious recording to help remember her by. To this day, he still calls and thanks the Dream Foundation for granting his wife's wish. I've been blessed to work with Dream Foundation. The organization has impacted me in so many ways. I think when you see and experience someone's dream with them, it lives on within you. It's life-changing. We all have problems, but we have to stop thinking of ourselves and focus on the bigger picture. There are people suffering all over the world, and we can make life a little bit better -- even if only for a moment -- one dream at a time. Priscilla Presley heads to the Hill with the Humane Society of the U.S. It was a busy day on the Hill in terms of star-gazing. With the spotlight on actors Seth Rogen and Ben Affleck, Elvis’ ex-wife Priscilla Presley quietly roamed the marble halls of Congress on Wednesday. The former Mrs. Presley was spotted dining at 701 restaurant and a reliable tipster gave us the full story. 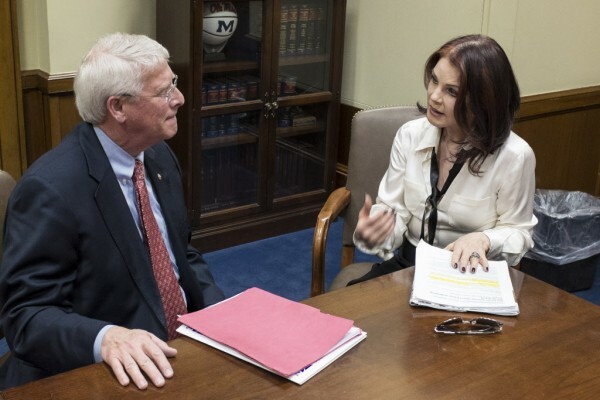 Over two days Priscilla Presley, accompanied by a rep from the Humane Society of the United States, met with 11 members overall, including Majority House Whip Kevin McCarthy (R-Calif.) and Sen. Bob Corker (R-Tenn.).